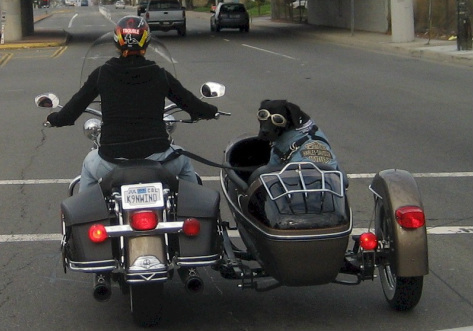 How Emma Zen became a biker dog! My husband I and both ride and we haven't missed the 1,500 mile putt to Sturgis South Dakota from Anaheim California in years. Soon after we got Emma and the dilemma followed as the time approached to leave we couldn't figure out what to do, leaving her at home was not an option but then again not going to Sturgis wasn't an option either. It was time for us to do some pretty heavy thinking as vacation was now only a month away. This is not the typical heavy thinking that you may think would have gone on. First Emma has been around the sounds of a bike since day one, she was never fearful and she became accustomed to the noises of a Harley or two. So we took her up the street to a neighbor's house who has a sidecar to see how she reacted to it and low and behold she jumped right in! The rest as they say, is history. When it came time to leave for South Dakota we had to be responsible dog owners. And you can't take off for a 3,000 mile around trip for your first ride. So for the first time we took our RV with us and figured we just do a few miles everyday to build up Emma's motorcycle skills and endurance. Now let's stop right here... How many of you realize the dog commitment going on in this house! We are not even surprise we purchased our dog a bike but we still can't believe we took a trailer all the way there, just for her! Day one we took off for about an hour and we couldn't believe what we saw. That dog sat and checked out the passing parade as if she had been doing it her whole life. She sits side to side to shifts her weight whenever she needs too. She stands when she needs to stand and stretches out when she needs to stretch. She lays down when she wants out of the wind and she has toys in the side car and she takes time to play with them. She has an open water dish and she'll drink on the road and when nap time rolls around, well she knocks out, even at 65 MPH. It was the weirdest thing. She loved it! She gets right in when it starts and you have to ask her more than once just to get her out of the darn thing. She road so much that by the time we left she Sturgis on that very first year she had over 2,000 miles under her tail and next year she was putting there it all the way! It is a sight to see, one that prepared her for a life as a canine model. You can't get three miles from the house and someone is taking her picture. If you want to take a picture and you see her roaring down the roads in Southern California (or anyplace else) give her a call out "Hey Emma!" She'll look right at you, on cue, picture perfect! This attention is what lead to promoting the public awareness of animals, via The Emma Zen Foundation.